Watering Your Garden Plants by hand, the traditional way. 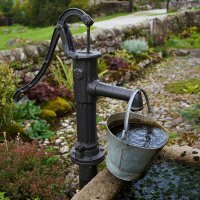 Watering by hand is a necessity for many gardeners when an extensive drip irrigation system is not available. Even if a drip irrigation system is in place for part of the garden, inevitably there will be far-flung plants and container plants that are not on the drip system. You can water with a hose, a watering can or with buckets. Water plants in planters when the top of the soil feels dry to the touch. Apply water with a hose or watering can until the soil is evenly damp all the way through the pot and water starts to seep out of the drainage holes in the bottom. 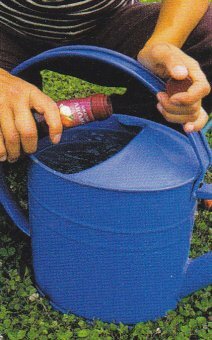 This is a good way to flush excess fertilizer salts that collect in the plant, but it can be an ineffective watering method. If the soil pulls away from the sides of the pot, water will run right through. If you are watering in the garden and are using a hose. Place the hose near the ground at the base of the plant and set the hose on a soaker or sprinkle setting and allow the water to seep into the soil all around the base of the plant. Keep the hose in place until the soil from the area from under the tips of the canopy to the base of the trunk is saturated. Use twenty litre buckets to apply a lot of water quickly to a shrub or tree that is beyond the reach of a hose. Tilt the bucket slowly, gradually pouring the water over the area. Apply the water only as fast as the ground can absorb it. If the water begins to run off away from the base of the plant, wait a few moments before applying more water. When it rains after a dry spell, the first flush of rainfall is likely to be laden with dust and pollutants. You can divert the polluted rainfall by attaching a small bypass pipe to the end of your drainpipe, a temporary measure that will dispose of unwanted rainfall down the drain. Do not forget to remove the bypass after the first flush of rainfall so that you can continue collecting the clean rain.